It has yet to be officially confirmed by Winco but I have many sources who say the new Coeur d' Alene Winco will be opening on November 7th. The sign out front says March 2014 but it is believed that the chain is way ahead of schedule and / or the date in 2014 is for the entire project which will eventually include businesses other then Winco. 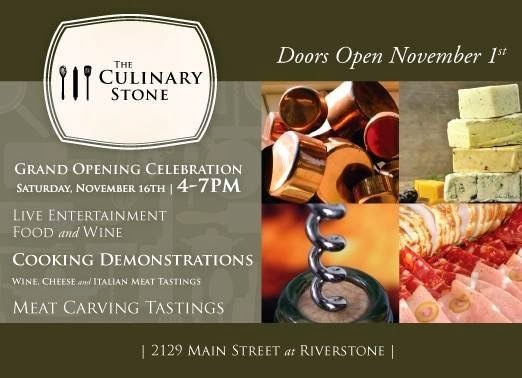 The Culinary Stone is a new gourmet food / kitchen supply store opening at Riverstone in Coeur d' Alene. They are shooting for doors to open November 1st , with a big grand opening celebration on November 16th . Signs went up this week on the new Total Wine & More store in Spokane Valley nearby Spokane Valley Mall. This new store will open on November 21st . Note : In all 3 cases Inland Northwest Business Watch intends to visit each one shortly after opening and report on / get photos of each new business, so please stay tuned to www.inlandnwbusiness.com .